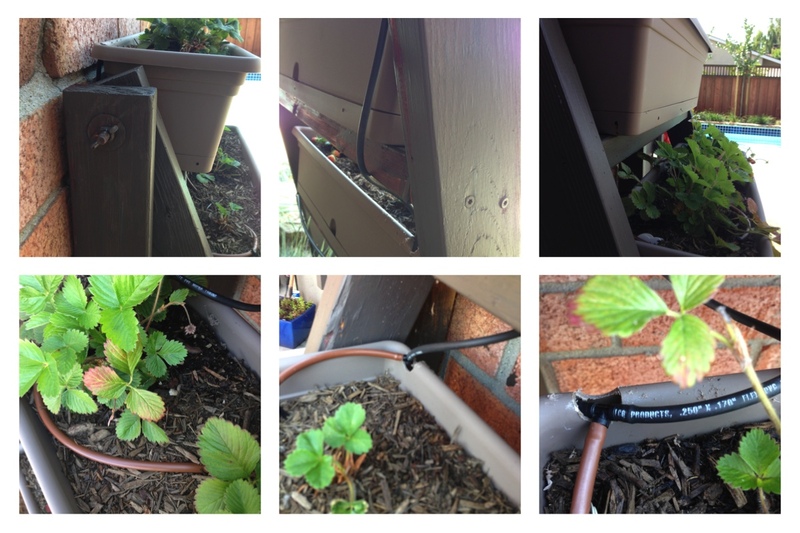 One of the DIY projects making the rounds on-line is planting strawberries in gutters. The photos look so wonderful. A couple of my friends forwarded the projects to me because they thought this would be right up my alley; I love to garden, I like to build things and I can operate power tools. Gutters. 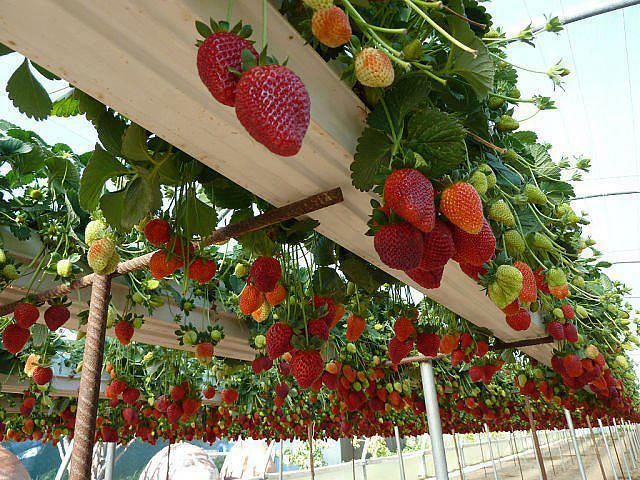 Gutters large enough to adequately grow strawberries – 7-8″ in diameter – are commercial gutters, which are not easily found at the hardware store (at least in my area), but found online or through a gutter company. 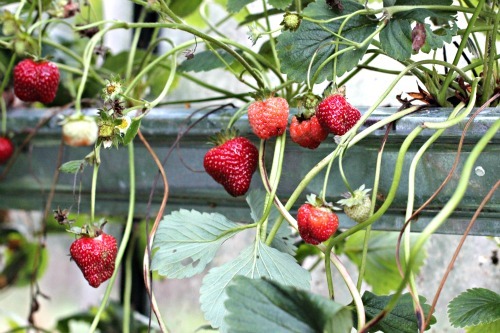 Residential gutters, which are available at a hardware store, are usually 4-5″ in diameter, but I think they are too shallow for strawberries in the long run (more than 1-2 seasons). Strawberries’ root systems can run about 8-12″. I initially tried the residential gutter, but it was a really tight fit. If you use gutters, you will need to cut them to length if you’re putting them in a space smaller than 10′. Either use sheet metal snips or a saw. The manual method is not all that easy to do; use a chop saw if you have it. One alternative to the gutter is an irrigation/sewer system drainpipe. It is available from some hardware stores (but your better bet might be online as well), and comes in 8″ x 10′ sections. You will need to drill holes into the pipe to plant your strawberries. You can use a hole saw that attaches to your drill (approx. $12-30). If you live in an area where reclaimed materials are easily available, you can search for old rain gutters and repurpose them. Placement. I realized when I looked around my yard to position my strawberries, that there were very few places that get enough sun, are out of the way of the dogs, wont interfere with other plants, and easily accessible. The best spot that I found was up against my chimney. I considered running gutters along one of my fence lines but I have other plants to contend with, as well as a number of birds that like to perch there. Mounting. Once I decided on the location, I considered mounting right onto the chimney brick. However, I didn’t want it to be a permanent placement because I like the option to move things around in my garden, and if I did move it, then I would be left with holes in my masonry. So, I decided on the ladder/easel approach. This project was definitely morphing away from the original idea. Building. I had two 2 x 4 x 8’s left over from another project, and so I purchased two more, along with four washers, two 4″ bolts, two wing nuts, and a small box of deck screws. I built a ladder/easel with four tiers on one side with the other side flush against the chimney. I originally painted the wood to look old, spattered and distressed, but it didn’t fit with the feel of the landscape, so I repainted it to match our pergola and arbor. I couldn’t easily locate commercial gutters, and after deciding that I didn’t like the residential gutters that I put together and actually mounted and planted, I opted for self-watering planters (so much for the gutter idea – Ha). I drilled some additional drainage holes into the planters because I would be using a drip system and wanted to make sure that excess water did not flood the planter reservoirs. 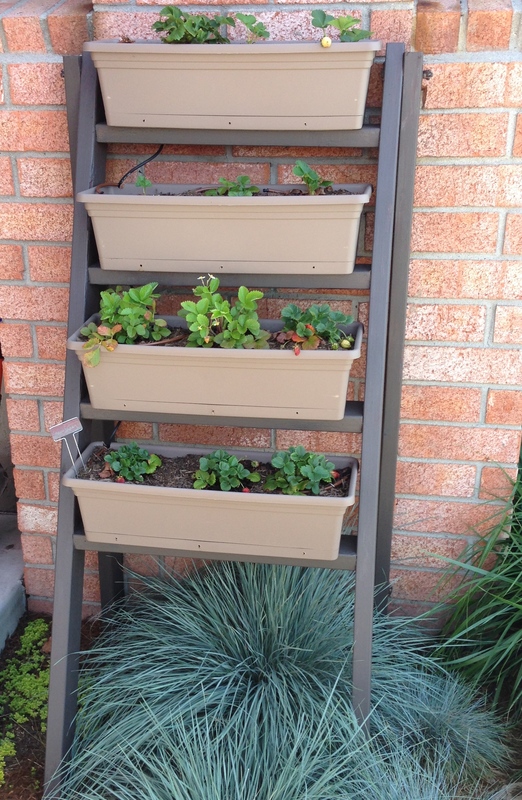 Once the holes were drilled, the planters were mounted onto the tiers. Next, I used a dremel tool to carve out an indentation on each planter lip to run my dripline between tiers and planters. Once the dripline was in place, I hooked it up to a timer. Its not the project I had initially in mind, but I like the outcome just the same, it works in the small space and it serves the same purpose. Gardening is always a lesson for me to be flexible in my thinking and my expectations; sometimes I have to be willing to scrap it all and start over. I never thought of using gutters before. that is so awesome. thanks for the post and the great pictures too. It’s a shame because planting at different levels always sounds interesting but realistically a gutter is all about drainage!